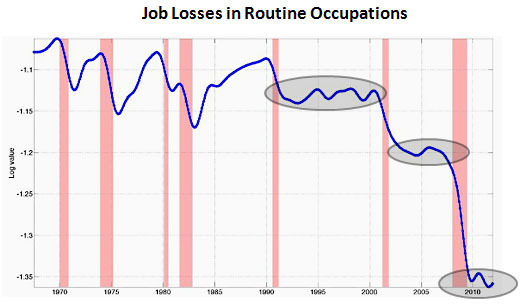 Most of the job losses during the past three recessions have come from the ranks of occupations coded as routine. And unlike previous recessions, these jobs don’t come back during the subsequent recoveries. The chart below shows the permanence of these job losses in the aftermath of our last three recessions. Automation and the adoption of computing technology is leading to the decline of middle-wage jobs of many stripes, both blue-collar jobs in production and maintenance occupations and white-collar jobs in office and administrative support. It is affecting both male- and female-dominated professions and it is happening broadly across industries — manufacturing, wholesale and retail trade, financial services, and even public administration. This is only the tip of the iceberg, and better education can only make a small dent in it. I suspect that over the next several decades, this is going to be one of our most serious economic issues, but it’s one that we’ll mostly try to deny because the solution is so intractable. So instead we’ll make up other explanations and continue to flail around. But like it or not, machines are going to get more and more competent over time, and they’re going to perform more and more of the work. Eventually we’ll have to face up to it. Have you ever watched “How It’s Made”? The extent of factory automation, even in places you wouldn’t expect, like food production, is mind-boggling. It’s impossible to watch even one episode and come away wondering where the manufacturing jobs went. It almost doesn’t matter if they went overseas — the bigger issue is that they don’t require humans anymore. All that’s left is for us to automate the factory automation factory and we’ll be all done…. This comment, of course, would have been delivered to me by an actual human being 20 years ago.